The Faculty of Biology at Gadjah Mada University has been initiated by considering the fact that Indonesia is one of the richest countries in term of natural resources, including floras and faunas. Therefore, Gadjah Mada University need to develop Biology as a strong basic science in order to support other biological-based subjects. 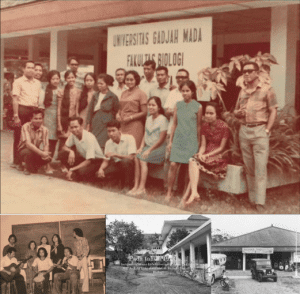 The high level education of Biology at Gadjah Mada University began with Baccalaureat Biologi in Medical, Dentistry, and Pharmacy. Botany department, which used to be a part of Agriculture and Forestry of Gadjah Mada University. The founding fathers of the Faculty of Biology at UGM are Prof. Drs. R. Radiopoetro as the first Dean and Prof. drg. R. G. Indojono as the faculty secretary. Other persons behind its establishment are Prof. dr. Soewasono, Prof. Ir. Gembong Tjitrosoepomo, and Ir. Soeryo Sodo Adisewoyo. The first enrolled-students were students who have joined into Baccalaureat Biologi in Medical, Destistry, and Pharmacy. At the past, the Faculty of Biology was situated in Mangkubumen area of Yogyakarta along with Faculty of Medical, Dendistry, and Farmacy. The Faculty of Biology had been occupying North Sekip of Yogyakarta building since 1970. During 1955-1979, the Faculty of Biology offered undergraduate degree (B.Sc.) that could be accomplished within three years, and then students continued to bachelor degree (Drs.) for two years. Since 1980, the undergraduate and bachelor degree has replaced to be bachelor degree (S1) by using semester credit system and it can be achieved in four years. According to decree of the Minister of Culture and Education no. 0553/0/1983 in December 8th 1983, between academic year 1983/84 – 1994/95, the Faculty of Biology UGM held three departments, namely Botany Department, Zoology Department, and Environmental Science Department. In addition, According to decree of the Minister of Culture and Education no. 056/U/1994 date of March 19th 1994 and No. 0219/U/1995 date of July 25th 1995, and afterward in 1994/95, three departments were converted into one department which is Department of Biology.